I've spent the last few nights not doing anything but being with my family and praying...but there have been a few nights i can't sleep so i've gotten up and sewn (its a great stress reliever for me). 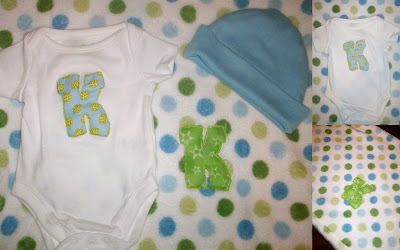 Here is one of the orders i've finished for Baby Keaton. I've gotten alot of baby orders lately and as i said earlier in another post its giving me baby fever...not a high one just a mild one..haha! No really, who doesn't love baby stuff, its just so cute and sweet! Baby Keaton who will be here soon. I hope he loves his hat, onesie, and blanket!